Opened in 2011, the White River Valley Trail System contains a series of mountain-biking trails on the south side of Lake Taneycomo. The trail system won a national award in 2011 from the Coalition for Recreational Trails. 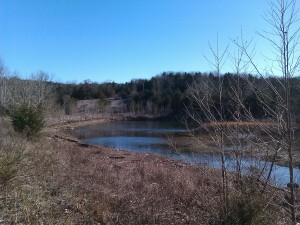 The two trails, including the half-mile connector trail between them, made 6-mile hike. This sign marks the beginning of the Red Trail, which is the entry to the trail system from the main trailhead that is across Hwy 265 from Table Rock State Park. 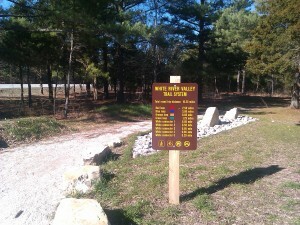 The system is made up of several loop trails (Red, Blue, Orange and Green) joined by several smaller connecting trails. The trails have become a favorite of day-hikers and mountain bikers alike. The entire trail system covers 10.25 miles and is designated as a mountain-biking trail system. Hikers are welcome but remember that bicyclists have the right of way. For safety reasons, horses and ATVs are not allowed on the trails. This sign marks the beginning of the Red Trail, which is the entry to the trail system from the main trailhead that is across Hwy 265 from Table Rock State Park. 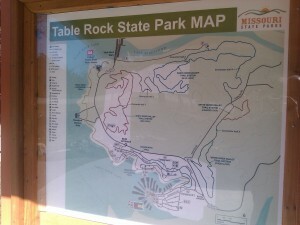 At the main trailhead, Red Trail, there's a kiosk that displays a map of the entire trail system. There are two trailheads to the system, both with parking areas. The main trailhead is off Hwy 265, across the road from the entrance to Table Rock State Park. This gives access to northern loops in the system, also known as Red and Blue trails. The southern trailhead at the end of Trophy Run Road, off Hwy 265, gives direct access to the Green and Orange trails. The terrain is level to moderately sloped, which makes it ideal for off-road bicycling, and it's a fairly easy hike for walkers. Whenever you encounter slopes, switchbacks make the inclines less severe. 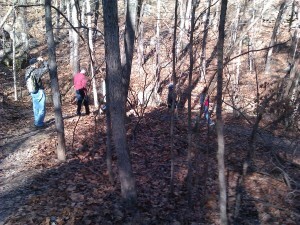 Elevations range from 1,200 feet to 710 feet where the trail parallels Lake Taneycomo. The connector trail between the Red and Blue trails leads along the shore of a tranquil pond, which is a great spot for a break or a lunch. The Blue Trail was the most diverse and provides the most elevation change, nearly 400 feet. 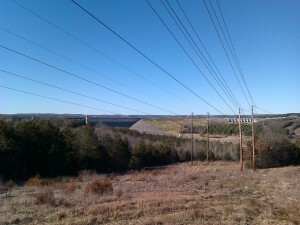 At the lowest point, it parallels the south shore of Lake Taneycomo and then climbs the north slope of Baird Mountain. The Blue Trail crosses powerline as elevation climbs to nearly 1,200 feet. It offers views of Table Rock Dam, Shepherd of the Hills Fish Hatchery and Chateau on the Lake Resort. Because there are several loops and connecting trails, it can be easy to get turned around. Though hikers are never far from civilization, it’s recommend less experienced hikers get a printed trail map from the State Park ranger's office or take a photo of the map at the trailhead. This will help hikers navigate the trail systems. Also, GPS is a great option that will help locate Geocaches locations on the trail system. Check out Seven Ways to Get Active on Your Branson Vacation!